For centuries, the chamberpot, along with the outdoor privy, was one of the few options for most people when they needed to urinate or defecate. Chamberpots were found throughout a house, but typically in private areas, such as under the bed. Wealthier people often had special rooms or closets for using the chamberpot in greater privacy. Often, chamberpots were enclosed in wooden commodes or close stools. Interestingly, there are numerous accounts of chamberpots being located and used in dining rooms, especially in the sixteenth and seventeenth century. 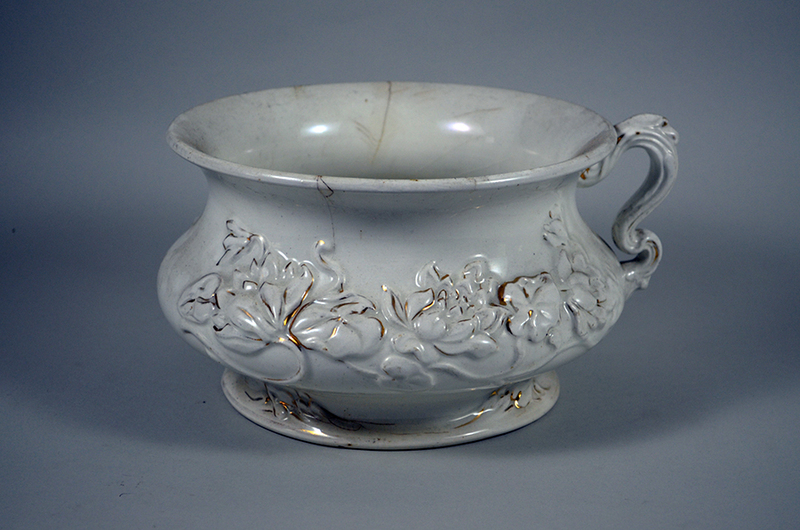 From the fourteenth to the eighteenth century, chamberpots were frequently made of metals such as pewter, but also finer metals such as silver and gold. By the eighteenth century, most chamberpots were made out of earthenware or porcelain. These earthenware and porcelain chamberpots of the nineteenth century were often fancifully decorated. By the end of the nineteenth century, chamberpots would again be made of metal, now of cheap enamel. Perhaps the most interesting question surrounding the chamberpot is the disposal of its contents. In wealthier households, the emptying of chamberpots would be a task for servants, who would empty them into pails. In large cities like London, England, for example, the pail contents would then be dumped into cess pits, outdoor collection casks, or the outdoor privy. We don’t know where the Walters dumped the contents of their chamberpots, but we can guess that it might have been into the outdoor privy.